The bead artists in High Strung are almost as colorful as the glass beads they create. I love to read crafting cozy mysteries, just as I love to read books set in the UK, Canada, and states I’ve never visited: it’s armchair education. What a fun quick cozy mystery. This is the first book in the glass bead mystery series and it is a wonderful introduction to this series. The interaction between all the characters is fun to read, and there are plenty of humorous incidents as well. Mojitos will make me smile for the rest of my life! 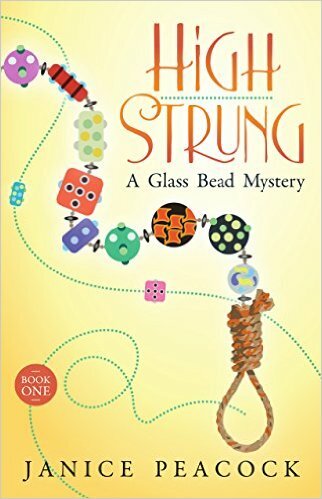 I liked Jax and enjoyed reading about how she created a new life for herself as a bead-maker. She is smart, talented and good-hearted. A fun light mystery set in Seattle. 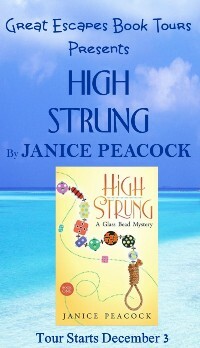 High Strung , A Glass Bead Mystery ebook will be 99 cents from Dec 5 to Dec 9. A Bead in the Hand , book two in the Glass Bead Mystery Series, is now available. Both can be found in paperback and ebook editions on Amazon , Barnes and Noble, and iTunes. The book will be on 99 cent promo Dec 5 through 9.